Television stations came to North Carolina beginning in the late 1940s, changing the lives of North Carolinians by providing them instant access to events, images, and ideas that had previously been unimagined. The state's first commercial TV stations were established in July 1949, when WBTV in Charlotte and WFMY-TV in Greensboro went on the air; both stations were properties of Jefferson Standard Life Insurance Company (Jefferson-Pilot Corporation). Live network television came to North Carolina on 30 Sept. 1950, when WBTV and WFMY-TV carried the University of North Carolina-Notre Dame football game from South Bend, Ind. In 1956 WRAL-TV of the Capital Broadcasting Company in Raleigh went on the air as an NBC affiliate. North Carolina's first educational, or public, TV station (and the tenth in the United States) was WUNC- TV in Chapel Hill, which first broadcast in 1955 after years of Federal Communications Commission hearings on public TV allocations. UNC-Chapel Hill president Gordon Gray and other university officials played key roles in bringing public TV to the state, arguing for the importance of a statewide educational TV network. WUNC- TV's first regular program was a UNC-Wake Forest basketball game. Since then, WUNC, as part of the national Public Broadcasting System, has focused chiefly on educational, historical, and cultural programming, including local shows such as North Carolina People and North Carolina Now. Local news programming has been arguably the commercial stations' most important contribution to North Carolina culture. Individual commercial stations have considered it an essential public service to alert viewers to dangerous weather conditions such as hurricanes and, in their aftermath, to fund-raising efforts for food, clothing, and money. At election time, North Carolina's local stations devote considerable attention to candidates and issues. With the rise of cable television in the 1980s, a growing number of local communities developed their own "public access" and government access networks to feature proceedings of local government bodies, community interest programs, and other programming developed by individual citizens. Cable companies were required to provide such public access to network space and equipment as part of their licensing agreements with the federal government and local municipalities, but changes in cable regulations through the 1990s reduced public access and the diversity of local programs produced. North Carolina's public access programs rarely rivaled the creativity or notoriety of programs developed in the nation's major urban areas, but by the early 2000s cities including Charlotte, Greensboro, Chapel Hill, and Raleigh had public access channels with robust local support. In 1996 James Fletcher Goodmon, the chief executive officer of Capitol Broadcasting Company, made WRAL-TV the nation's first station to transmit TV signals digitally. Some experts believe this may be one of the biggest changes in television since the introduction of color in the 1950s. By the early 2000s there were about 50 TV stations, both public and commercial, in the state. Only a handful of these were independent, with the others affiliates of the major national ABC, NBC, CBS, Fox, UPN, and WB networks. Harry Kenneth Smith, "Development of Educational Broadcasting in North Carolina, 1922 to 1972" (M.A. thesis, UNC-Chapel Hill, 1972). James Vickers, Raleigh, City of Oaks: An Illustrated History (1982). "History," UNC-TV. http://www.unctv.org/aboutus/history/index.html (accessed May 29, 2012). "WRAL-TV History Timeline." Capitol Broadcasting Company. http://www.cbc-raleigh.com/history/view_history.asp?division=wral-tv (accessed May 29, 2012). Layno, Charles. "Triad TV History." # (accessed May 29, 2012). Perkins, Betty Hutson, editor and compiler. The Evolution of Radio--with Pictures : WECT-TV's First Twenty Years 1954-1971. Wilmington, N.C.: William Madison Randall Library, University of North Carolina at Wilmington, 2004. "University of North Carolina Television Network records, 1949-1998." University Archives, University of North Carolina at Chapel Hill. http://www.lib.unc.edu/mss/uars/ead/40258.html (accessed May 29, 2012). "Inventory of the WBT/WBTV Corporate Records, ca. 1920 - 2000." J. Murrey Atkins Library, University of North Carolina at Charlotte. http://jasmine.uncc.edu/search/?searchtype=o&searcharg=OCN463463554 (accessed May 29, 2012). N.C. Center for Public Policy Research, Inc. Cable Television in North Carolina. Raleigh, N.C. 1978. Jim Tucker, star of the Old Rebel-Pecos Pete Show, and his boxer, Troubles, 1958. 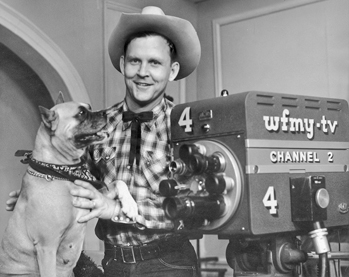 The popular children's program on WFMY-TV in Greensboro was locally produced. Photograph by WFMY-TV. North Carolina Collection, University of North Carolina at Chapel Hill Library. It was an interesting topic. In this era, the television becomes the need of people as it is also the means of communication. I was trying to find when Charlie Harvell, the sportscaster who was on WFMY. I know I was a kid when he was on and I just wondered how many years he did the sports on your station.